When a matrix is multiplied by a scalar then each element of that matrix is multiplied by the scalar. In general, we can say, if A = [aij]m x n is a matrix and ‘k’ is a scalar, then kA is another matrix which is obtained by multiplying each element of A by ‘k’. 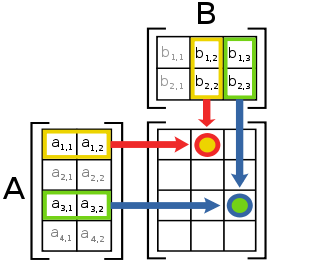 The product of two matrices A and B is defined if the number of columns of A is equal to the number of rows of B. Let A = [aij] be m x n matrix and B = [bjk] be an n x p matrix. 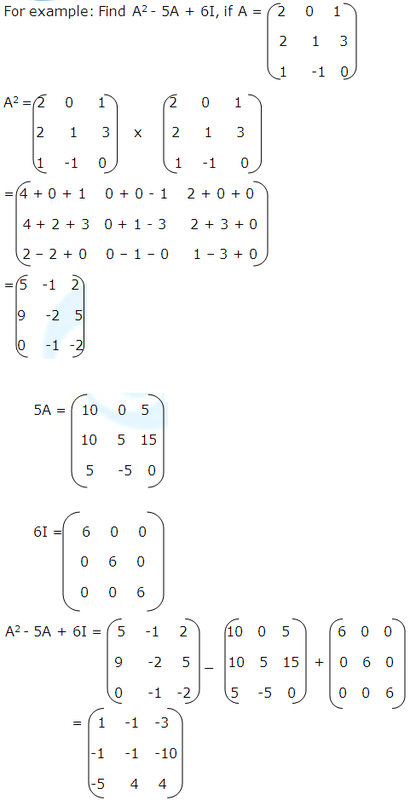 Then, the product of A and B is a matrix C of order m x p.
Solution: Matrix A has 2 columns and B has 2 rows, so number of columns of 1st matrix is same as number of rows of 2nd matrix, hence it is conformable for multiplication. (AB)C = A(BC), whenever both sides of equality are defined.